What is the resurrection of 1 Corinthians 15? We continue sharing thoughts on the resurrection and 1 Corinthians 15 from Holger Neubaur. Be sure to read the previous installment. 1 Corinthians 15:49, “And as we have borne the image of the earthy, we shall bear the image of the heavenly.” The church had borne the image of Old Covenant Judaism, but now it was to bear the image of the spiritual man in Christ. The perfect man would be presented after the miraculous age would end (Ephesians 4:13). The Corinthians were longing to seeing “face to face” that they would know about their true spiritual identity in Christ. They did not know while the miraculous age continued, for Paul argued, “for now we see through a glass darkly, but then face to face shall I know even as I am known ( 1 Corinthians 13:12). This comports with John’s statement, “Beloved, now are we the sons of God, it doth not yet what we shall be:but we know that, when he shall appear, we shall be like him for we shall be like him; for we shall see him as he is” (1 John 3:2). The final picture of the true spiritual man would be known at the revelation of Christ, and the spiritual gifts were promised until Christ’s return (1 Corinthians 1:6-8). 1 Corinthians 15:50, “Now this I say, brethren, that flesh and blood cannot inherit the kingdom of God; neither doth corruption inherit incorruption.” When Jesus came back in his physical body He was not in his glorified body as he challenged Thomas to thrust his finger in his side (John 20:27). In Luke’s account Jesus said, “Behold my hands and my feet, that it is I myself; for a spirit hath not flesh and bones” (Luke 24:39). Since “flesh and blood” will not inherit the spiritual nature of the kingdom, it is not a flesh and blood resurrection that Paul has in mind in here. The Old Covenant world that was inherited by “flesh and blood” is not how those would gain entrance into the spiritual kingdom of God, for Jesus taught that all men would have to be “born again” (John 3:3-5). Neither would a body that is “corruptible” or subject to death enter into the glorious kingdom of God. The early pilgrims were “begotten again to a lively hope by the resurrection of Jesus Christ from the dead, To an inheritance incorruptible, and undefiled, and that fadeth not away, reserved in heaven for you, who are kept by the power of God through faith unto salvation ready to be revealed in the last time” (1 Peter 1:4,5). The corruption that the early Christians escaped (2 Peter 1:4) was not physical but spiritual. This “already, but not yet,” that God would grant was not corruptible, but would be a body in which Jesus’ blood would clothe and change. The church which still had the remnants of Judaism in it was changing, but the change of how God viewed the church would come when God “would take away their sins” (Romans 11:25-27). Just as the High Priest granted the blessings of the covenant when he came out of the tabernacle to bless the people, so Jesus granted the forgiveness of sins as He came out of Heaven (Leviticus 9:20-22). This is the picture of Hebrews 9:24-27 as Jesus would appear a “second time without sin unto salvation.” This salvation was the topic of all the prophets as Peter instructed, “Receiving the end of your faith, even the salvation of your souls. Of which salvation the prophets have inquired diligently, who prophesied or the grace that should come unto you” (1 Peter 1:9,10). This is not Pentecost, for their salvation was still in their future and Isaiah prophesied that forgiveness would come “when he maketh all the stones of the altar as chalkstones” (Isaiah 27:9-13). This is a reference to the destruction of the temple. The change that Paul promised was spiritual and not physical. This is the precise meaning of “Behold I show you a mystery; We shall not all sleep, but we shall all be changed” (1 Corinthians 15:51). The change was spiritual and from God’s perspective. The change was one of stance, not substance. The forgiveness of sins is the topic. The final pronouncement of Romans 11:25-27 is the topic. This would take place after the fullness of the Gentiles. The church which now was granted the full forgiveness which was promised before the foundation of the world would come to pass. Paul’s statement, “we shall not all sleep” was not a promise to some distant generation but to the one he was addressing. Paul promised that not all the Corinthians would die before they would experience this change. As Paul affirmed to the Thessalonians, “and I pray your whole spirit and soul and body be preserved blameless unto the coming of our Lord Jesus Christ” (1 Thessalonians 5:23). Paul was not encouraging the Thessalonians to get a mortician to embalm their bodies so that they would be “preserved” for thousands of years, but rather praying that the Thessalonians would be alive to the coming of the Lord. All of this change would take place, “In a moment, in the twinkling of an eye, at the last trump: for the trumpet shall sound, and the dead shall be raised incorruptible , and we shall be changed” (1 Corinthians 15:52). The last trump is the seventh trump of the Revelation (10:7) as John announces the mystery of God is “finished” which corresponds to the trump that announced the “gathering” by Jesus and the end of the Jewish age (Mathew 24:30). John and Jesus speak of one consistent end. The “end” that Jesus predicted almost forty years earlier was “at hand” when John wrote the Revelation (Revelation 1:3; 22:10). John prophesied that in the time of the seventh trumpet the “kingdoms of this world are become the kingdoms of our Lord” (Revelation 11:15). There is no plural number in the original. The kingdoms had now transitioned into the kingdom! This was so God could be “all in all” (1 Corinthians 15:28) as God would unite both Jew and Gentile into one kingdom and that there would be “one king” over all the earth (Zechariah 14:9). This was Paul’s mission as he made known “the fellowship of the mystery” (Ephesians 3:9). The Mishna taught that the feast of the trumpets was the birthday of the world, as the New Heavens and New Earth would announce the New Covenant world ruled by life rather than by death. 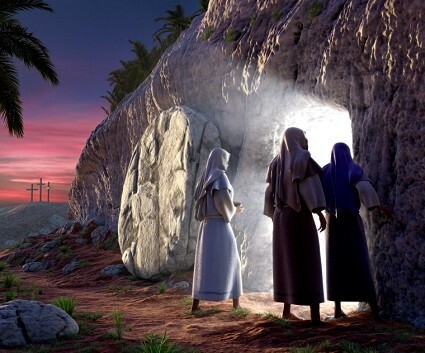 More on the resurrection coming up! And for more on the resurrection be sure to order Don K. Preston’s Seventy Weeks Are Determined…For the Resurrection. 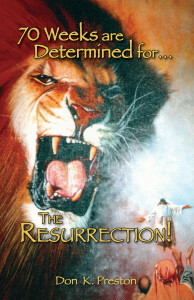 The book proves conclusively that the resurrection of 1 Corinthians 15 was in AD 70!